Of course the most likely reason is that most investors pile into these stocks near the peak of a cycle. There have been reams of shares printed for most of the juniors and they aren’t going to stay locked up forever. The good news is that this state of affairs is actually bullish for big picture investors. Using the junior mining laden S&P/TSX Venture Composite Index as a proxy for the lay of the land in resource stocks it can be seen that things haven’t been that bad. 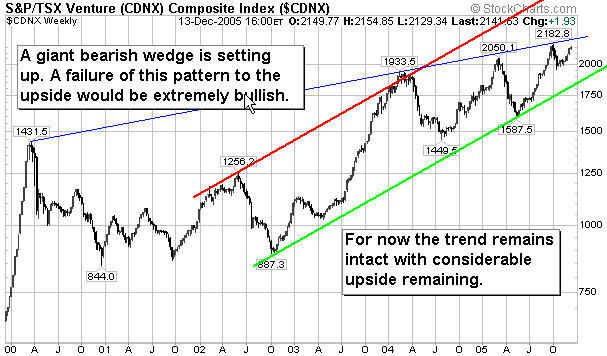 An uptrend is intact and speculators who bought in at the peak of disinterest have already been rewarded. However most people don’t buy cheap resource stocks for 50% gains so the impatience and discontent is understandable (we all have our issues). The good news is that there is a good junk of juicy upside left. Don’t wait until your cab driver starts telling you about mining stocks. The sector is setting up nicely.